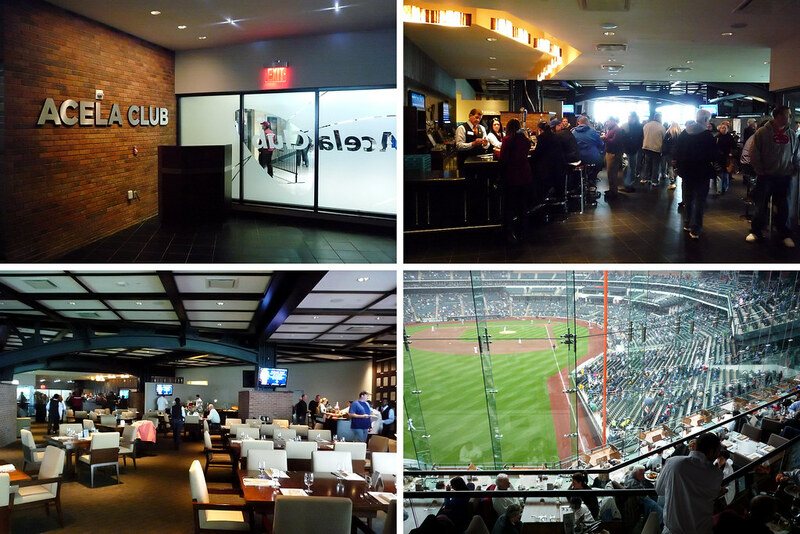 In this solo dining adventure, Gary dines finely at Citi Field’s Acela Club. In the two seasons I’ve been to Citi Field, I’ve certainly eaten my share of great food. When you’ve got Shake Shack, Blue Smoke, Mama’s of Corona… well, the list could go on forever, but the point is that one is hardly faced with a lack of dining options at the Mets’ world-class ballpark. Gone are the days when Nathan’s hot dogs and the two grilled sausage stands on each level at Shea Stadium constituted your best bets. I’m not denigrating those choices – after all, the hot dog is a classic ballpark staple – but the changing demographic of ballpark patrons accompanied by changing tastes necessitated a major improvement. That includes the constituency that happens to likes a little fine dining with their baseball. It was a fait accompli that, with teams moving to add more luxury seating areas to new and even existing ballparks, those sitting in those areas would want dining commensurate with that experience. Enter Drew Nieporent, of Nobu and Tribeca Grill fame (and fellow Stuyvesant alum! ), who stepped to the plate and took on the task of running the Acela Club out in the left field corner. Even better, the first thing he said when it was announced he would be in charge was that he was modeling the Acela Club on the aforementioned Tribeca Grill, going so far as to install one of its former chefs as executive chef. The concept from executive chef Michael Sobelman and Myriad Restaurant Group’s chef Stephen Lewandowski (Myriad is the group Nieperont’s restaurants belong to) was market-driven cuisine using local ingredients. Right from the start, it seemed like they had a plan in place, doing everything they could to bring a true fine dining experience to the ballpark. Now, all that was left to do was to execute. And execute they do. After being seated at my table, a four-top since that was the smallest they have even though I was dining alone (I felt bad but having it all to myself was niiiice), I set off to truly explore the space. It may not seem like it when you look out at the left field corner but the space is huge. It’s the width of the glass enclosure you can see from outside the restaurant but its depth goes all the way to the Citi Field exterior walls, essentially the entire width of the concourse and the stands that line the exterior. Some tables are better than the others – obviously, the ones that are tiered by the window overlooking the field are the best and they’re priced accordingly with a $10 premium tacked onto the prix fixe charge for the meal. I didn’t splurge for one of those tables but be forewarned that if you don’t, you’ll essentially be watching the game like you do at home, eating and glancing at a TV to see what’s going on albeit in a nice setting. The volume of the TV is reasonably loud – you can hear every word from Gary Cohen but it’s not obnoxious so that it makes eating there a chore. Also, the Mets pipe in the PA for the player announcements and any official game updates. You’ll feel disconnected from the action but you’ll be eating so much food, it won’t matter. Ah, yes, the food. 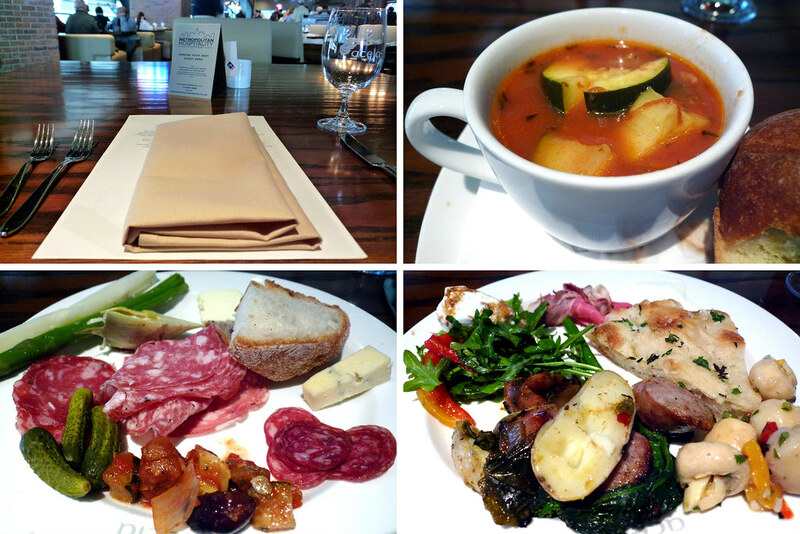 The setup at the Acela Club is this – for a prix fixe charge ($41 for lunch/brunch, $48 for dinner), you get the Market Table and a choice of one entrée. What is Market Table, you may ask? Well, it’s a series of stations along the exterior wall serving up Italian meats, salads, cheeses, sandwiches, soups, and many other appetizers. Also, you get unlimited access to it. 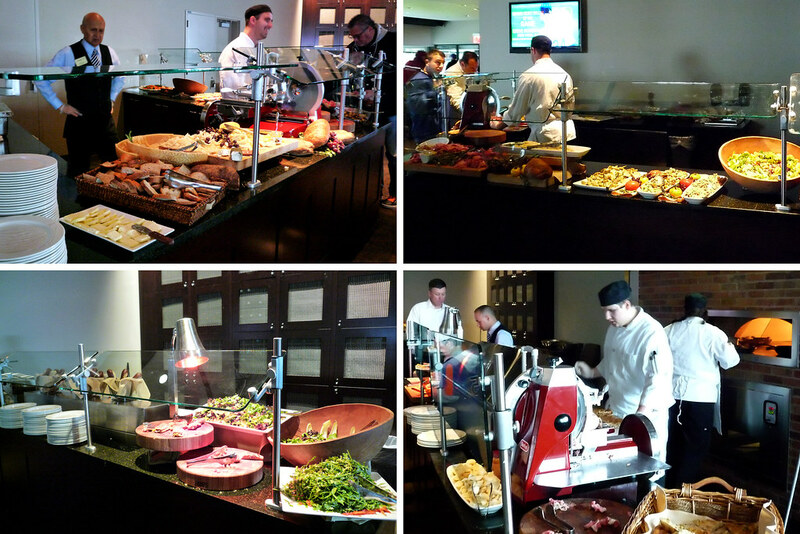 That’s right, it’s a buffet but it’s one of the best spreads you’ll ever see at one. My first pass at the Market Table was to the Butcher Block and Antipasti stations. Some prosciutto, salami, saucisson sec, cheeses, bread, cornichons, artichokes, asparagus (green and white), and caponata – basically, a little bit of everything. Second pass was at the Al Forno and Soup, Salad, Panini stations and a return trip to the Antipasti for some stuff I missed the first time around. On this plate was Italian sausage with broccoli rabe and potatoes, flatbread with roast beef and horseradish crème fraîche, arugula and buffalo mozzarella salad,and some marinated mushrooms. There was nothing on my two plates that was bad – the Italian meats were great, the flatbread had a healthy dusting of sea salt which was great with the roast beef that was slightly lacking in salt, and the italian sausage with broccoli rabe and potatoes was a tasty, filling treat. The only complaint I had with Market Table was their soup – the Metropolitan Clam Chowder which, you guessed it, was a Manhattan clam chowder. My general dislike for the style aside (no clam chowder but New England will do for me and Manhattan isn’t chowder, it’s soup), it was bland and the clams were hard to find. I finished maybe a third of it before moving on to the entrée. The entrées change (after all, it’s supposedly market-driven) but among my choices that day were a burger, crabcakes, ribs, and lemon chicken. All were standard issue ballpark restaurant fare until I reached the last item – a grilled 16 oz NY strip steak for a $5 supplemental charge. I hardly get steak when I go out (it’s one of the few things I can cook just as well as a restaurant) but it was easily the most appealing option and, when one is presented with steak, it’s hard to pass up. The moment the plate was put down in front of me, I knew I’d made the right choice. 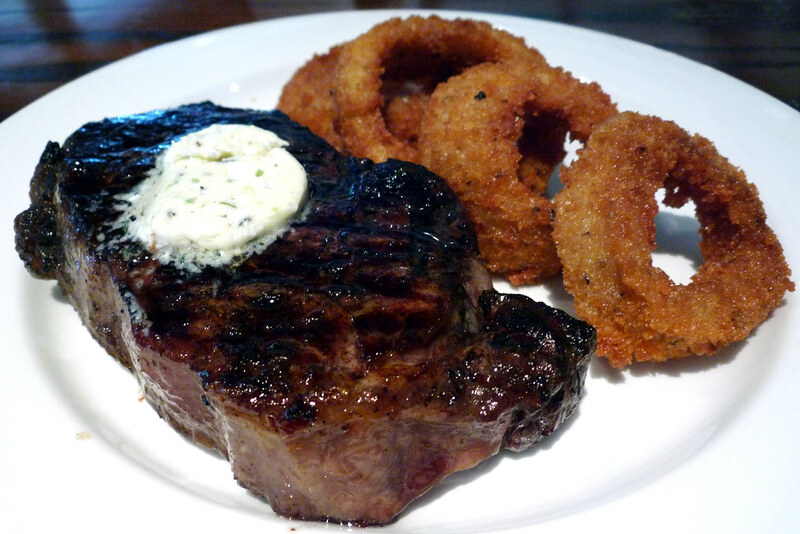 A perfect charred crust on a beautiful hunk of beef with some gorgeously fried onion rings on the side. 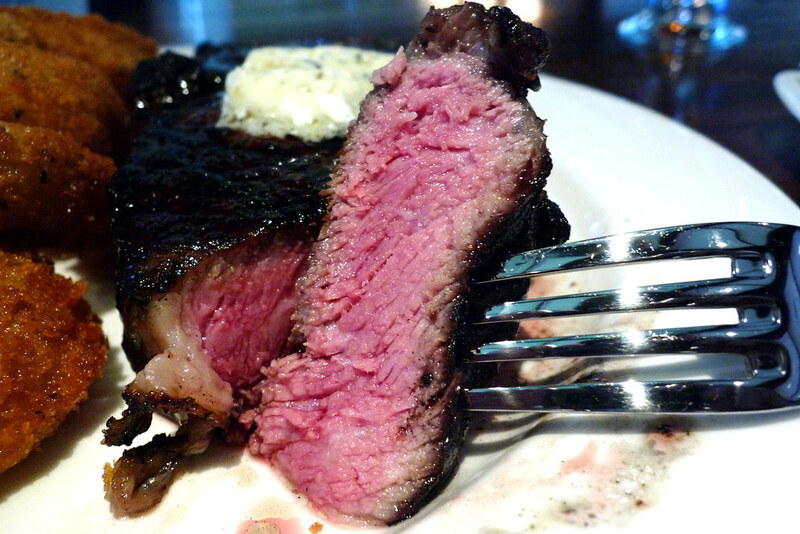 I ordered it medium-rare and, as you can tell from the photo below, they executed that to perfection. The herb butter on top was nice but absolutely unnecessary – the flavor of the steak acquitted itself. The onion rings had a salty, herb-laden batter that had trouble staying on the onion itself. Still, they were delicious even if they did fall apart a bit. Even with all the excellent food stands that litter the concourses at Citi Field, you’d be missing out if you never made it up to the Acela Club at least once – if not a season, then at least once in your life, Mets fans. At $41 or $48 for the meal and, at a minimum, $36 for a ticket to an eligible seating level, this certainly isn’t an inexpensive day at the ball park. But for what you get and considering the fact that this is indeed great food at your standard higher ball park prices, it’s at least a decent value. It’s even better value if you tell your waiter not to bring out your entrée until you’re ready, having gone a few rounds with Market Table. There’s a lot to offer there so it could take some time until you’re truly satisfied you’ve tried everything you wanted to try. Just don’t get too full if you’re getting the steak because you’ll be wanting to leave plenty of room for it. Besides, you can always go back up to Market Table after you finish your steak! One other thing I liked about the Acela Club was going on a day when it was miserable outside – raining and cold (this was in mid-May, too!). I spent the first four innings in the comfort of the restaurant before I headed out and I wished I had lingered longer inside, perhaps ordering more beers. My point – eating here in the colder months at either end of the season or during the wretched heat and humidity of July and August is an amazin’ thing. Acela Club at Citi Field. 123-01 Roosevelt Ave, Flushing, NY 11368. [Show/Hide Map] (718) 565-4333.
you neglected to mention the fact that it’s oddly the only place in the park you can get bottles of BK Pennant Ale and Ommegang Hennepin as well. Why they can’t throw some of those bottles in with “Big Apple Brews” downstairs is beyond me (actually, it’s not beyond me….I know exactly why. but still). Yes, I should note that I had the Brooklyn Pennant Ale with my meal. It’s possible those bottles might be available in the Ebbets (or whatever it’s called now) and Delta Clubs but we’ll never know since we’re not, ya know, rich.